Triticale, winter pea and winter rapeseed interseeded into corn silage in Ferrisburgh, Vermont. Photo: Kristen Workman. The Phosphorus Index is a tool developed to assess the potential for phosphorus runoff from individual fields based on soil and field characteristics and on management practices. The P Index is more comprehensive than relying only on a soil test value because it considers the likelihood that phosphorus present in a field will actually reach a surface water body, given transport factors. The P-Index provides a relative rating of the risk of P runoff from individual fields, which can be used to prioritize fields for nutrient and soil management practices. The Vermont P-Index traces phosphorus losses from field to water body along surface and subsurface pathways, accounting for both particulate and dissolved forms. While it is not a complete quantitative model, we have attempted to estimate relative P losses from several distinct sources (soil, fertilizer, and manure) as well as the effects of soil type, topography, and management practices. In each pathway, an estimate of the amount of phosphorus mobilized is modified by one or more multipliers for soil, crop, or management factors that reduce or increase P loss relative to a base amount. P losses from all sources are then added, and multiplied by a scaling factor to produce a P Index score. The latest revision of the Vermont P-Index (Version 6.0) includes updated precipitation records to account for climate change, additional crops (e.g., vegetables), an accounting for P loss through pattern tile drainage systems, an option for a third manure application, and additional conservation practices (e.g., cover crops and rapid manure incorporation). 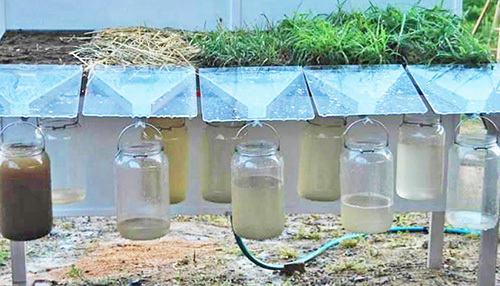 Rainfall simulator demonstrating soil runoff from various cover treatments. Photo: Joshua Faulkner.